Construction is now underway on a small but key link of Miami’s Baywalk. 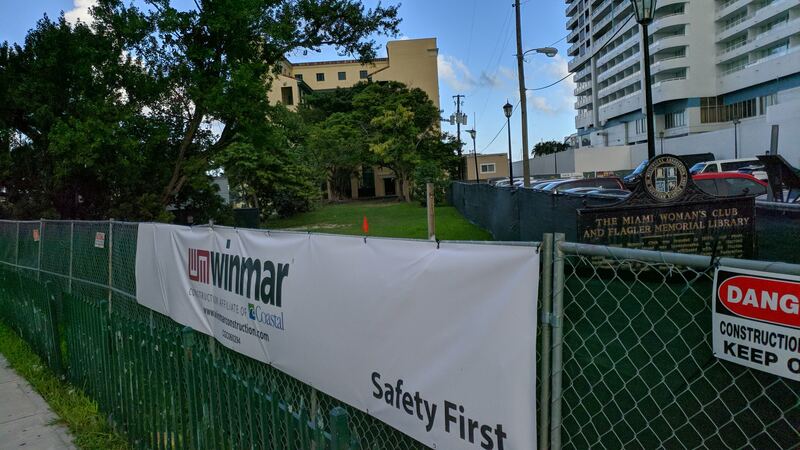 A groundbreaking ceremony was held last week last week for the new walkway, which will run for 300 feet behind the Miami Woman’s Club. Pedestrians will soon be able to walk along the bay from Margaret Pace Park and continue towards the Venetian Causeway without needing a detour to the street. Eventually, the goal is for a five mile continuous path from Brickell to the Design District area, commissioner Ken Russell said. The Miami Woman’s Club building itself is also under construction, with plans that include a restaurant and rooftop bar. Yea! The Venetian gets a lot of walkers and cyclists, this will be a great addition. Can’t wait to be able to walk another 300 feet without getting hit by a car! It’s sad that there is zero bicycle connectivity from the Venetian Causeway on the Miami side. Downtown to Miami Beach should be a high priority bike route yet there is zero safe, marked route for cyclists to take. This has been a priority for the past 40 years. With each new project along the Edgewater bayfront, Baywalk is becoming a reality. Anyone know the estimated completion date? July 2024 with bow quickly the government does things here. Will there be groundbreaking and grand openings for ever mile so Commissioner Russell can get selfies? Too Late, I broke this news 2 months ago. BTW, I want the Connection to Museum Park through Miami Herald site. That is the Holy Grail. Build the whole thing already, it should be done, that’s it!! !